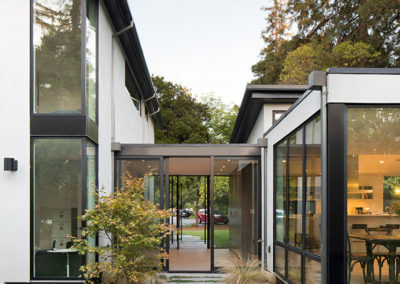 The clients for the Creekside Residence, a pair of Silicon Valley serial entrepreneurs, approached the firm looking to create a unique home for work and play for themselves and their three active boys. 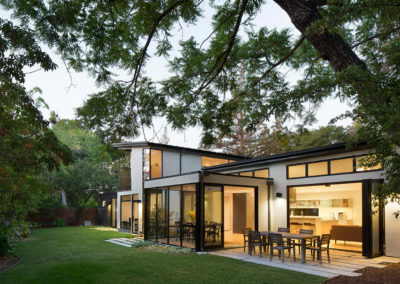 They chose the property for its unique character and placement—in Palo Alto—an existing ranch-style home on a quiet cul-de-sac with a generous front yard, and a seasonal creek running through the rear of the property. 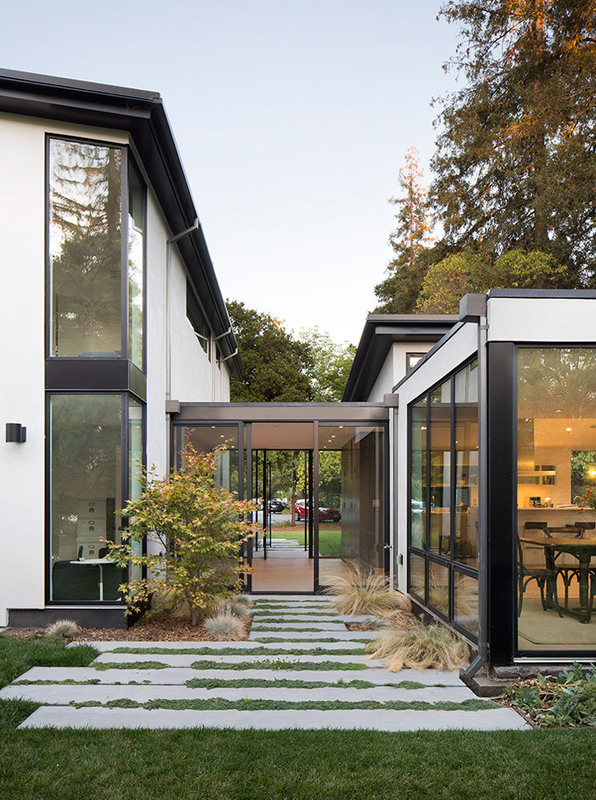 The existing home had endured a series of additions and alternations over the years that resulted in awkward spaces and confused aesthetics. For the remodel, the architects retained the footprint of the existing house, and opened it up to form the basis of the public areas, including the kitchen, living room, and dining room. These spaces open up to an outdoor patio and eating area, merging in to the rear yard and creek beyond. 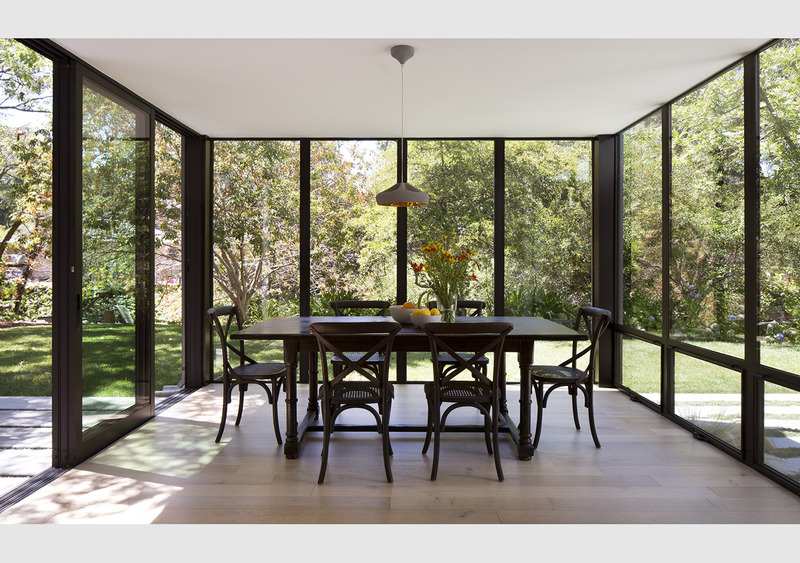 The dining room projects into the rear yard as a glass box surrounded by landscape, creating a space for enjoying time with family and friends and holding impromptu work meetings. 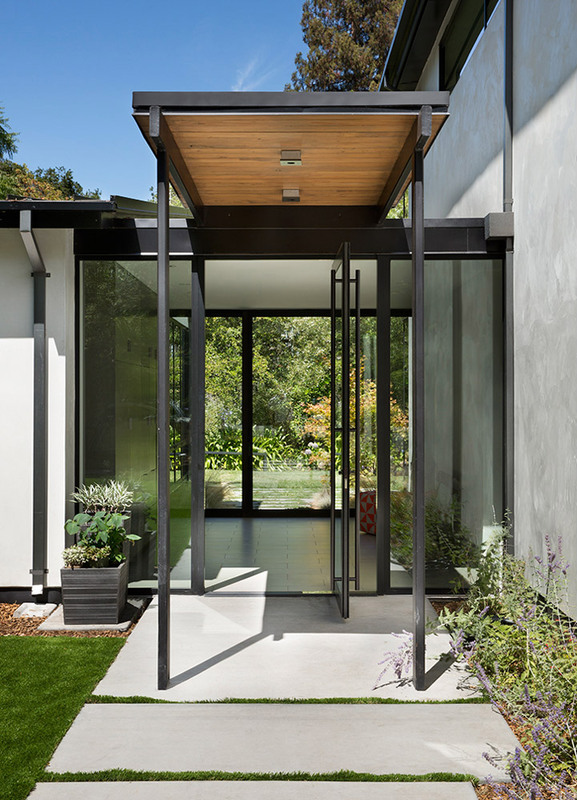 At the center of the home, a glass entry vestibule separates the public and private spaces within the house. 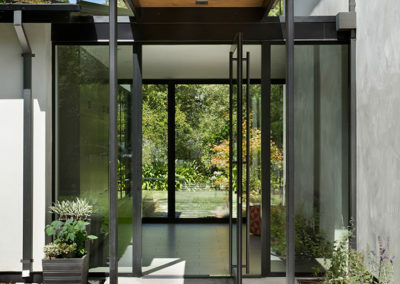 It draws the family and visitors into the home and through to the sanctuary of the rear yard. This space, that provides a clear divide between public and private, helps the clients balance their live/work dynamic. The private wing is a modern, two-story addition. The master bedroom, which is located on the ground floor is directly connected to the backyard greenery, while the boys’ upstairs rooms have a treehouse-like feel. The finish palette is very restrained to leave room for brightening the spaces with the clients’ vast book collection at the interior, and the natural beauty of the site at the exterior. The white polished concrete floors with radiant heating allow the family to seamlessly move barefoot from inside to outside creating a truly inviting home.